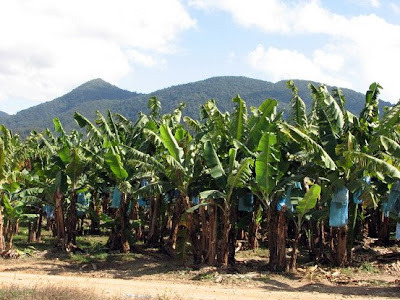 Banana plantations are usually scattered about in the countrysides , farmed as a cash crop by petty farmers beside the Highways , with the famous veiny banana leaves standing up and the fibrous stems not so tall. Strangely dark hills & valleys are usually found close by ( see pix ) . You can buy the fruits in the neighborhood fruit shop or if you like , the exciting backstreets where you can bargain for fun. ...as long as they look fresh & not overly soft. They are amongst the world's best and most popular fruits with a high energy content and rich in potassium , and easily digestible ! Yo ! why your banana look a bit weird ? Hair ? Haha, the photos look so funny! Malaysian bananas are nice, a bit different from those in uk. banana is very good for constipation! sugar bean, how different is it between msian banana and uk banana??? 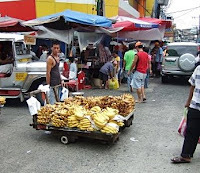 bananas... great fried, masak lemak, in buburchachas, in protein shakes, made into cakes, breads.. sighh..luvv it! oh yes, cheap too! hahha .. what a luscious post. nothing beats bananas on a moody day. its self contained and once skin is unleashed , quite potent !